While Giant Loop didn't invent the horseshoe design it was one of the first companies to see the benefit of this design for offroad and adventure luggage. The Great Basin and the smaller Coyote saddlebags have proven to be an interesting option for travel. 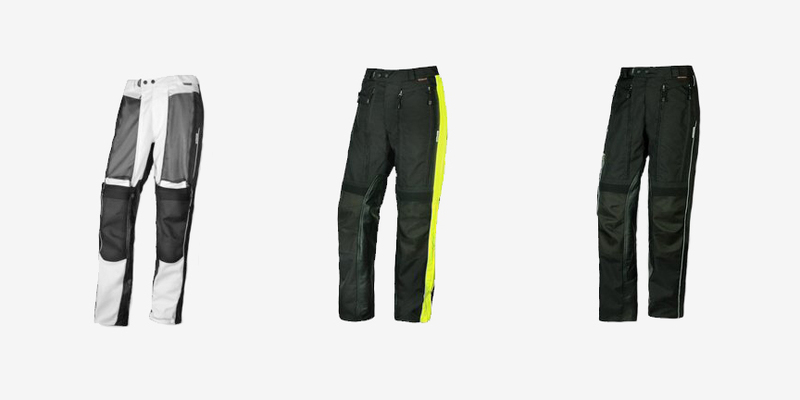 The Olympia Motoquest pants are a versatile and protective piece of riding gear. They have enough protection for street riding and a fit that is also compatible with adventure and dual sport riding. They are a perfect complement to the Motoquest Jacket. Green Chile Adventure Gear is not a common name in the dual sport or adventure market yet. GCAG, as they call themselves, is a relatively new company with a completely different opinion on luggage systems for dual sport and adventure motorcycles. The Olympia Motoquest jacket is a full featured four season riding jacket. It has the flexibility and comfort needed for dual sport riding while maintaining the protective features required for street riding. Simply put, this jacket is a do-it-all motorcycle jacket. When I started riding my dual sport bike I found a whole new type of gear was needed. I never had a dirt bike as a kid so I had no idea what offroad riding gear would be best for what I was doing. I also found that the available choices for gear that successfully crosses over between street and offroad is pretty limited. Motonaut Adventure Motorcycle Luggage in action. The Motonaut lightweight luggage system for motorcycles is a simple, but highly effective product. At first glance it doesn’t look like anything special, but when you get it installed and go for a ride the design really shines. Aeromoto Dry Tour Boot in action. The Aeromoto Dry Tour motorcycle boots are a great value if you are looking for a good waterproof touring boot. They are reasonably protective, comfortable, and performed as advertised in the wet weather. Once I started using ear plugs, I never stopped. Every time I ride, I protect my ears and as a result my ride is safer and more enjoyable. I have experimented with many different ear plugs and I have settled on a few favorites I want to tell you about. The Sliders Cold Pro Waterproof Kevlar Riding Gloves pack a lot of value into a great pair of gloves. It’s hard to find a good waterproof winter glove under $50, but this one fits the bill.